CTECH Specializes in the design and manufacture of light-weight aluminum alloy storage systems used within a wide variety of mobile equipment applications; including utility, fire fighting, mobile command vehicles and any service trailers. 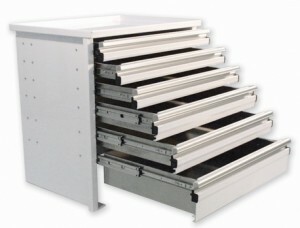 CTECH’s exclusive Tool Drawer Units expand the utility of your service vehicle and increase the ease of use. Time tested for performance in racing and industrial applications, the patented MotionLatch™ drawer latching mechanism is extremely easy to open and always stays shut in transit. • Patented MotionLatch™ Drawer System. • Lightweight & extremely strong all aluminum alloy construction. • Tough & durable powder coat finish.